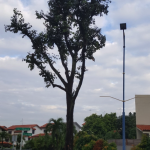 With over 2 million trees in Singapore, there are massive variances in maintenance standards between trees. A commonly seen example of bad pruning is “topping”. This practice chops large branches back to a pre-determined limit, into stubs without sufficiently large leaf-bearing branches (also known as a “terminal leader”) nearby. Some trees decline and eventually die because of periodic topping. Topping is a temporary solution at the expense of overall tree health. Other more sustainable solutions, like thinning and size reduction, could have been implemented with the same resources. Here is a Syzygium grande that has been repeatedly topped for “safety purposes”. This species has been criticized for its weak branches, but one cannot help but question if bad pruning practices have led to its poor reputation. Notice how branches end abruptly. 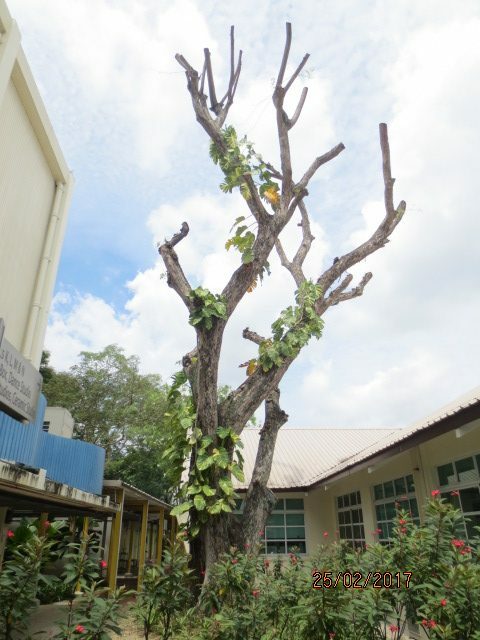 The tree’s natural shape is destroyed, while the topped branches try to put out new leaves to replace lost foliage, giving the tree spots of bushy growth. Leaves are the photosynthetic factories of a tree; no leaves = no food to support living cells. Tree longevity should always be kept in mind when pruning. Done by a skilled operator, pruning can improve the overall structure, stability, and health of the tree. Done poorly, higher maintenance costs and hazards from unstable sprout production are likely. This Alstonia angustiloba below displays good previous pruning. It has grown short, fat, and dense. Unlike a topped tree, constant maintenance isn’t necessary, its natural shape is retained, and is unlikely to be a public risk. Plenty of Singaporean trees are topped as a management strategy. With the exception of a few extraordinary circumstances, topping does more harm than good. We need to understand that while topping might be the easiest solution, it isn’t a sustainable one. Maintenance frequency for a topped tree (to remove new weakly attached shoots) can run up to once every 3 months. In contrast, a well-managed tree can go for 3 or more years without attention. For trees in private estates, hiring competent people for tree management is key. 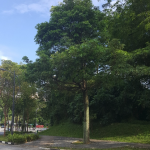 Whereas for public trees, signs of poor tree management can be reported to the relevant authorities via https://www.oneservice.sg/.